I love to eat fresh fish. Fish shines when cooked correctly and benefits from a simple preparation method. A compound butter compliments trout like you wouldn't believe. 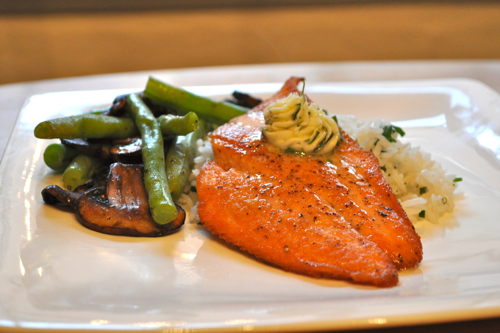 The brightness of the lemon and freshness of the herbs, bring out the best the fish has to offer. 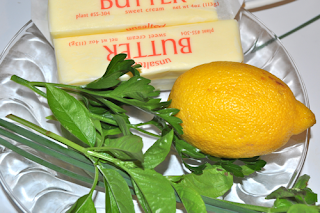 This is a great meal for entertaining, because the butter can be made the night before. When the butter is piped out, it makes a gourmet presentation. The herbed jasmine rice and sauteed green beans make delicious sides for a complete meal. Once you make this, your family will frequently request it. 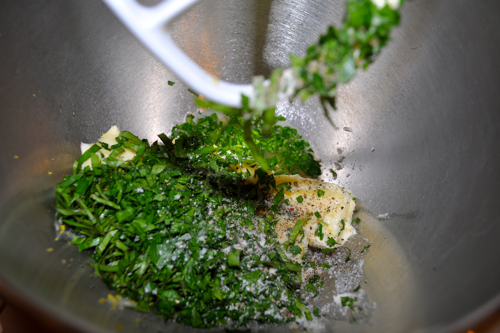 Combine the softened better with herbs,lemon zest and juice, and salt and pepper. Once blended, you may roll in saran wrap into a log or pipe out on parchment, using the tip of your choice. The place in the refrigerator. This butter can be frozen once done and placed in a plastic bag. 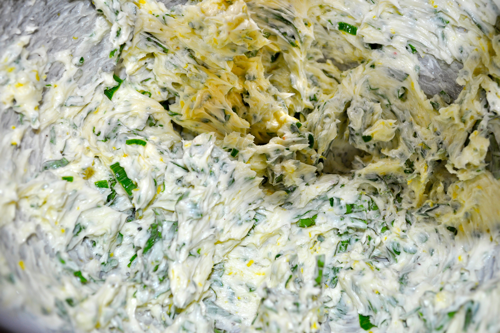 This can be used as emergency sauce or just butter to dip your bread in. 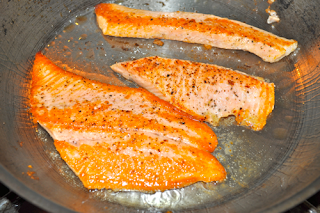 When using it to serve, let it soften slightly so it melts on to your fish beautifully. To make the fish, heat pan on high heat. Add 1 tablespoon oil. Add seasoned fish. Let sit 2-4 minutes or until golden brown. Continue to cook on the other side for 2-4 minutes. Cook to at least 145 degrees F.
A quick and easy side! Carrots are a wonderful vegetable and perfect for fall. They are fairly cheap and high in nutrients such as beta carotene. 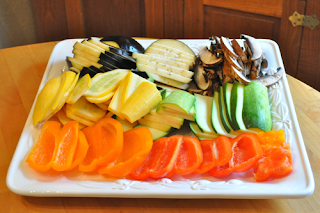 There are many ways to prepare these delightful veggies. 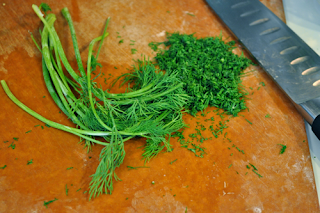 My favorite herb with carrots is dill. It is a classic combination. 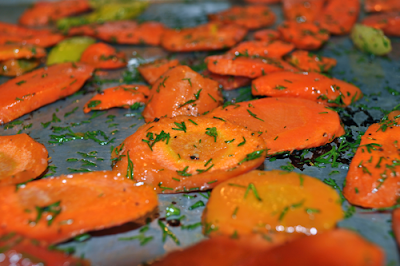 Dill brings out the sweetness of the carrots and gives a great contrasting flavor. So if you want a quick and easy vegetable side, this is the way to go. Heat oven to to 425F. 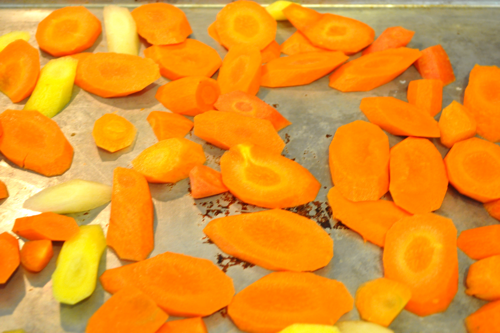 Toss carrots in olive oil,salt and pepper. Spread out on a sheet pan in a single layer. Cook 15-20 minutes or until fork tender. Once out of the oven toss with chopped dill. Enjoy. 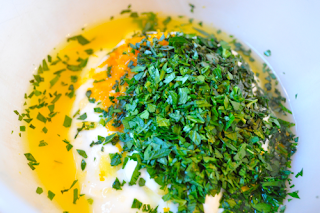 If you do not like dill, mint or parsley could be substituted. This is a great way to get your veggies. Enjoy as a side with a variety of dishes! An amazing coconut ice cream! This dessert is inspired by one of my many trips to the British Virgin Islands. 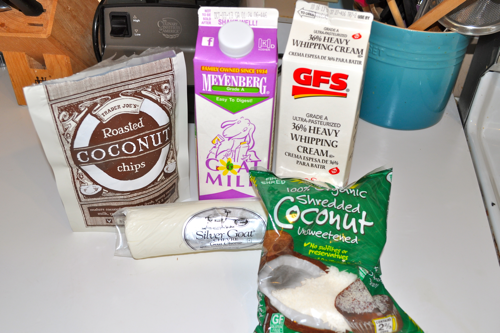 I have never forgotten that delightful and heavenly coconut ice cream that was discovered on the tropical island. My family and I enjoyed this dessert as frequently as we could in our short time. Since then,nothing has compared. I have dreamt about this amazing delight. Once I learned how to make ice cream, I had to recreate it. Every time I eat it, it takes me back to that mountainous island. I am transported back to the white sand beaches, dirt roads and the smell of salt in the air. Create this wonderful dessert and let it deliver you to the beautiful island. It is well worth the trip! In a small sauce pan, heat up 2 cups goats milk, heavy cream, sugar, corn syrup and coconut. Heat until boiling and boil about 2 minutes. 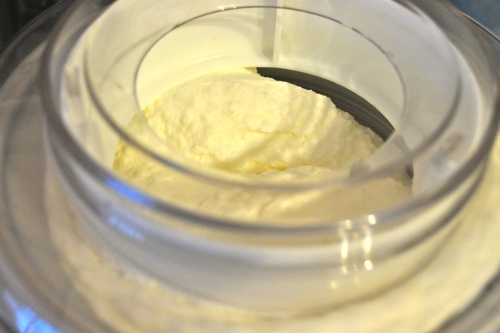 Meanwhile, combine cornstarch and 2 tablespoons goats milk. 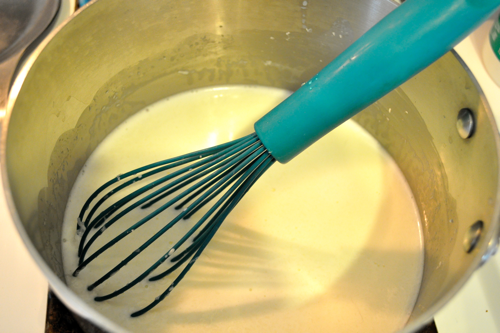 Add this slurry to heated goat milk mixture and cook until slightly thickened. Remove from heat. Take some of the hot mixture and mix in with goat cheese. Then add this back in to the rest of milk mixture. Cool down and then freeze according to ice cream maker instructions. Pack in a plastic container and freeze. Place plastic wrap over top of ice cream and freeze. 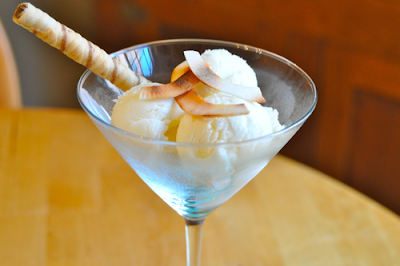 To serve, top with toasted coconut shavings. It would also be grate drizzled with dark chocolate fudge. Enjoy! 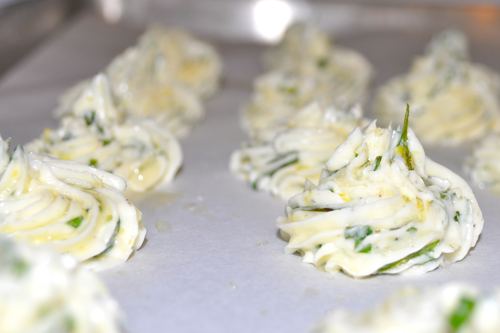 What to do with all that tarragon! 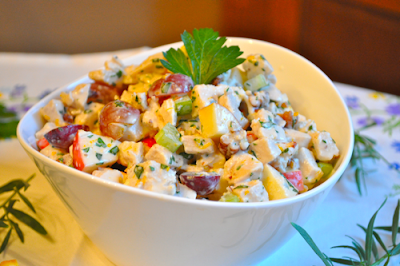 I don't know anyone who doesn't like a nice chicken salad. This is a lighter version of the traditional. It is loaded with fresh herbs, fruit and nuts. It goes great on a sandwich or over some greens. I added tarragon to this dish, because it is bountiful in my garden right now. 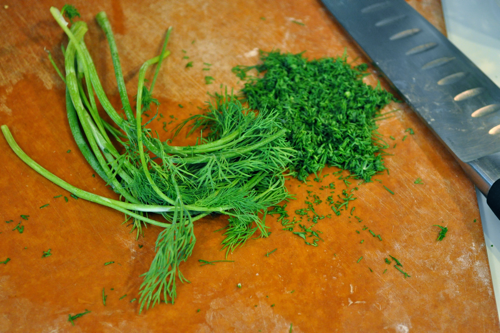 If you don't like tarragon, feel free to substitute with dill or basil. Enjoy this light and refreshing salad. Combine chicken, celery, grapes, apple, and pecans. 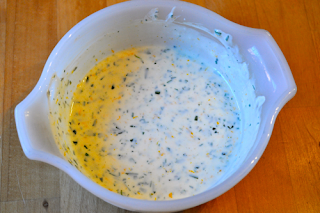 Combine yogurt, zest, juice, tarragon, honey and parsley. 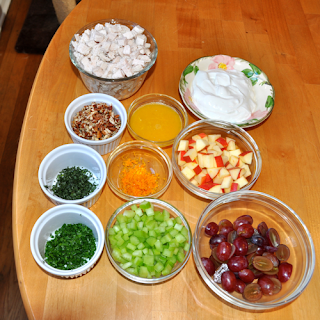 Combine the chicken with the dressing and season to taste with salt and pepper. Let sit for at least 1 hour. Garnish with tarragon, parsley and oranges. 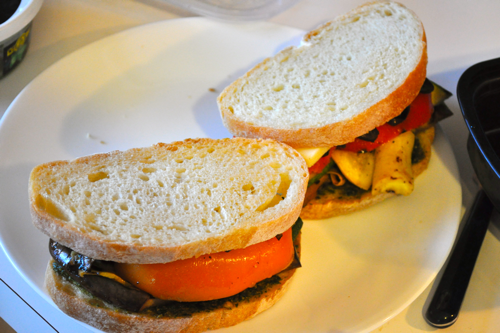 I made this sandwich when I lived in my apartment at Ohio University. I didn't want to do to much cooking, but wanted something very flavorful and quick. Now it is a family favorite, even by meat eaters alike. 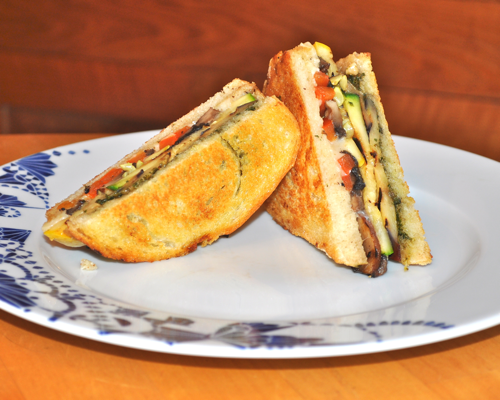 This sandwich could easily become carnivorous or be made vegan depending on your preferences. I love this sandwich because it can be made all year round. Just swap out with whatever is in season. I have made this with butternut squash and even cabbage. The vegetables can be grilled, sautéed or roasted depending on the amount time you have. I love this sandwich, it takes me back to my pre-culinary school days. I knew much about cooking but not nearly as much as I know now. This sandwich is great served with baked sweet potato fries or chips. Toss squash, zucchini, peppers and mushrooms in olive oil and salt and pepper. Lightly oil your grill pan and heat until smoking. Grill eggplant and set aside. 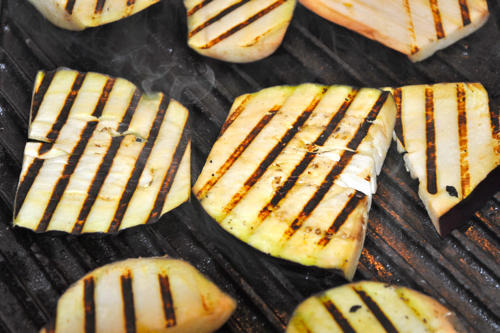 Grill each vegetable for 2-3 minutes, grilling both sides. 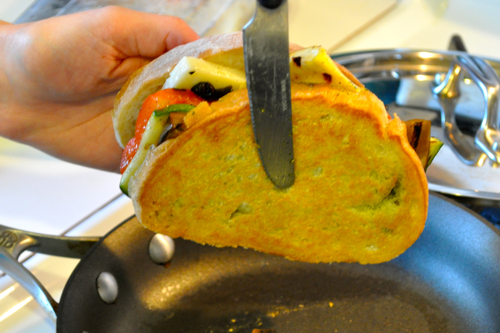 Using two pieces of ciabbatta bread, slather one side with pesto. Place eggplant, zucchini, squash, pepper and mushrooms on sandwich. Top with sliced gruyere cheese. Top with second slice of bread. 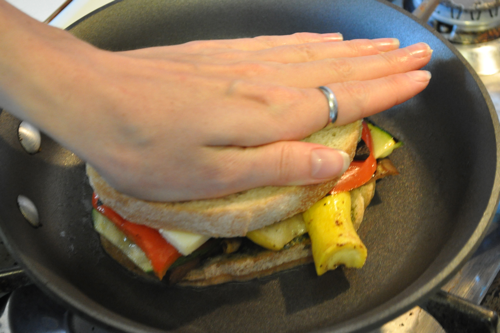 Press firmly to flatten sandwich slightly. Heat pan to medium high heat. Add enough olive oil to coat pan. Place sandwich cheese side down and press firmly. Cover with lid and cook 2-3 minutes per side or until golden brown. Repeat on other side. Enjoy!